Entry: Grades AAA. Other qualifications are accepted. The world’s leading companies need people who can operate in complex, innovation-intensive, data-driven environments – people who can analyse problems using quantitative tools and qualitative methods, take decisions in the face of uncertainty and risk, and deliver results through people. 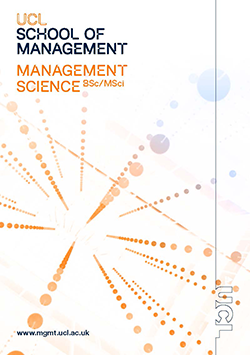 Management Science provides a rigorous, practical foundation in these critical skills. UCL’s Management Science undergraduate degree programme launched in September 2014. Unlike any other undergraduate degree in the UK, the programme will provide you with an opportunity to develop strong quantitative and analytical skills, an in-depth understanding of how companies work, and a rigorous foundation in the key skills needed to build successful careers in global businesses. The Management Science degree programmes are taught in London by UCL’s School of Management, which offers innovative undergraduate, postgraduate, and doctoral programmes to prepare people for leadership roles in the next generation of innovation-intensive organisations. The School works closely with global companies and innovative start-ups at the cutting edge of management science practice. You will also benefit from being part of UCL Engineering, UCL’s Faculty of Engineering Sciences, and take an Engineering Sciences Minor in Years 2 and 3. This provides an opportunity to work with students from other departments and develop knowledge and skills in an interdisciplinary area (e.g. Data Science). You will also have the option to study a modern foreign language as your Minor. On graduation, you will have strong leadership and communication skills and the ability to work flexibly, creatively and internationally in a range of areas, including high-growth companies, management consulting firms and the finance sector. The global economy is changing: More than 30 billion pieces of content are shared on Facebook every month; and companies capture trillions of bytes of information about customers, suppliers, and operations. This explosion of data is disrupting industries and creating new opportunities. UCL’s Management Science programmes provide students with an in-depth knowledge and understanding of management science and how it can be applied in practice. Students will develop a critical appreciation of the relevant principles of mathematics, engineering and science and how they can be applied in complex, innovation-intensive, data-driven environments. In Year 1, you will take eight modules that will provide you with a rigorous foundation in key concepts and tools that underpin the practice of management. In The Art and Science of Management, you will learn how organisations create, deliver and capture value, and explore the range of interdisciplinary problems faced by managers operating in complex, innovation-intensive, data-driven environments. You will take two modules on the Mathematical Foundations of Management, covering single and multi-variate calculus and linear algebra, and two modules on Business Economics. You will take a module on Critical Analytical Thinking, designed to provide you with the concepts and tools required to analyse complex issues and develop powerful, well-grounded arguments, and your first module on Data Analytics. You will also take a module on Behavioural Science, which will introduce you to the key concepts and principles underlying the systematic investigation and analysis of human behaviour. Each term, you will also undertake two Scenario Weeks. During a Scenario Week you will be given a real interdisciplinary management problem that you will work on in teams. For example, it might be a problem related to one UCL’s Grand Challenges like Global Health and Wellness. Your objective is to solve the problem by 5pm on the Friday using whatever knowledge and tools you need. The Scenario Weeks will be challenging. But so is business. In Year 2, you will take core modules on Strategy, Operations Management and Finance to broaden your understanding of how companies work. You will take additional modules on the Mathematical Foundations of Management, Data Analytics and Computational Thinking to continue to develop your quantitative skills, and a module on Design. You will also select and start your Engineering Sciences Minor. In Year 3, you will take additional core modules on Marketing and Decision and Risk Analysis and a second Finance module. You will also take a module on Delivering Results Through People. You will also finish the Engineering Sciences Minor you started in Year 2 and complete your dissertation. The four-year programme offers students an extra year over the Management Science BSc to extend their knowledge and skills in specialist areas. In Year 4, students take core courses in Global Business, Business Diagnostics and Design, and Leadership, Ethics and Communications. Students also complete a Management Science Concentration and a Group Consultancy Project. Students take an Engineering Sciences Minor in Years 2 and 3. This consists of three integrated courses – one taken in Year 2 and two taken in Year 3. The Minor provides an opportunity to work with students from other departments and develop knowledge and skills in an interdisciplinary area (e.g. Data Science). You also have the option to study a modern foreign language as your Minor. The dissertation (completed in Year 3) provides an opportunity to work in-depth on a business issue that interests you and showcase the knowledge and skills you have gained. It should demonstrate your ability to collect and synthesize information and show your ability to use that information critically to present original conclusions, insights and arguments. The dissertation should be about 12,000 words in length, excluding appendices. 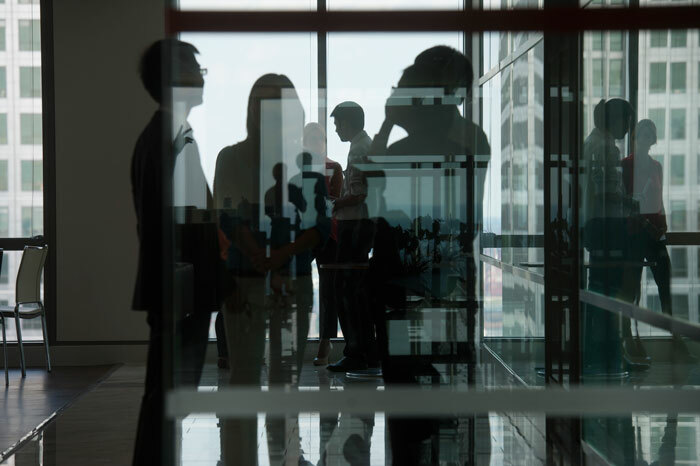 The Group Consultancy Project (completed in Year 4 – MSci only) provides an opportunity to work as part of a small team tackling an important business issue facing a company. Our students are, and always have been, selected on the basis of their talent and potential, whatever their personal, social or national background. UCL was the first English university to admit students regardless of race, class or religion, and the first to admit female students on equal terms with men. UCL degree programmes require our students to think critically and creatively, to tackle ambitious projects and to develop the leadership and entrepreneurial skills that will stand them in excellent stead for their future lives and careers. Our innovative Management Science degree programmes embody this approach to undergraduate study. We are looking for intellectually curious, self-motivated students who are passionate about business, technology and people. You will join an international cohort of students drawn from a wide variety of backgrounds. Your application will be assessed on the basis of past and projected academic performance and your personal statement. For UK based students, English Language and Mathematics at grade C. Grade C or equivalent in a foreign language (other than Ancient Greek, Biblical Hebrew or Latin) is required. UCL provides opportunities to meet this requirement following enrolment at UCL. Note that these requirements are for Home/EU applicants who have been solely educated in the UK (ie this does not apply to international applicants completing their A Levels in the UK). If English is not your first language, from 2016 the English language requirement is for the ‘Advanced’ level. For acceptable English Language tests see here. 38 points. A score of 18 points in three higher level subjects including 6 in Higher Level Mathematics with no score lower than 5. A variety of other qualifications are accepted from the UK and worldwide. If you have any queries regarding your eligibility to the programme or queries about the programme, then please contact us via the email below. UCL is London’s Global University – your studies will provide a global perspective which will help you understand the major issues facing the world and will equip you to contribute to solutions. Around 41% of our students come from outside the UK, so UCL has a cosmopolitan, friendly and inclusive atmosphere. You can apply through the UK Universities and Colleges Admissions Service (UCAS) system from 1 September onwards for entry in September the following year. For further information regarding applying to UCL via UCAS please see application and entry. For further information regarding the Management Science programmes, please contact Susan Moffat, Undergraduate Administrator, UCL School of Management. undergraduate-admissions@ucl.ac.uk. Remember to always include your UCAS ID number in your email. UCL is committed to becoming a global leader in enterprise and open innovation, supporting knowledge exchange, innovation, entrepreneurship and collaboration with commercial and social enterprises. You can apply for this course for entry in September 2019 through the UK Universities and Colleges Admissions Service (UCAS) system from September 2018 onwards. The earlier you apply the better, as we expect that the programmes will be heavily over-subscribed. UCL is one of the world’s very-best universities, consistently placed in the global top 20 in a wide variety of world rankings. UCL’s new Management Science programmes are unlike any other degree in the UK. They provide you with an opportunity to develop strong quantitative and analytical skills, an in-depth understanding of how companies work, and a rigorous foundation in the key skills needed to build successful careers in global businesses. The programmes are taught in London by UCL’s School of Management, which offers innovative undergraduate, postgraduate, and doctoral programmes to prepare people for leadership roles in the next generation of innovation-intensive organisations. The School works closely with global companies and innovative start-ups at the cutting edge of management science practice. You will also benefit from being part of UCL Engineering, UCL’s Faculty of Engineering Sciences, and take an Engineering Sciences Minor in Years 2 and 3. This provides an opportunity to work with students from other departments and develop knowledge and skills in an interdisciplinary area (e.g. Data Science). You also have the option to study a modern foreign language as your Minor. Experience the world of business while you study and benefit from access to graduate recruiters and serious start-up support. As a Management Science student, you will have access to a bespoke Careers and Employer Engagement programme and a dedicated careers team who will help you present yourself to leading graduate employers with confidence. We believe that practical experience alongside theoretical study will give you a unique perspective and a competitive edge in the global labour market. Our Management Science programme offers all our students the opportunity to undertake a summer internship and you will receive dedicated support from our Internships and Vacancies Officer. You are encouraged to engage with the internship programme so that advice and opportunities can be tailored to the cohort. By undertaking a summer internship your academic studies will be enriched with new perspectives, experiences and enhanced skills. Students can gain experience in a variety of sectors such as Banking, Finance, Management Consulting, Technology and Start-Ups. Previous students have undertaken internships at a range of companies, large and small, both in the UK and overseas. This includes BCG, NMPi, Ogilvy, Philips, Rolls Royce, JP Morgan, EY, Markit, Credit Suisse, Doorda and Quid. UCL is consistently ranked as one of the world’s very best universities and employers are keen to meet our students to discuss the opportunities they offer. In addition to the bespoke activities within the School of Management, you also have access to the central UCL Careers provision. Every year over 1000 employers/organisations attend events arranged by UCL Careers, including careers fairs, employer presentations and sector ‘themed weeks’, which may include employer forums, networking events, talks on how to get into the sector and one-to-one advice sessions.